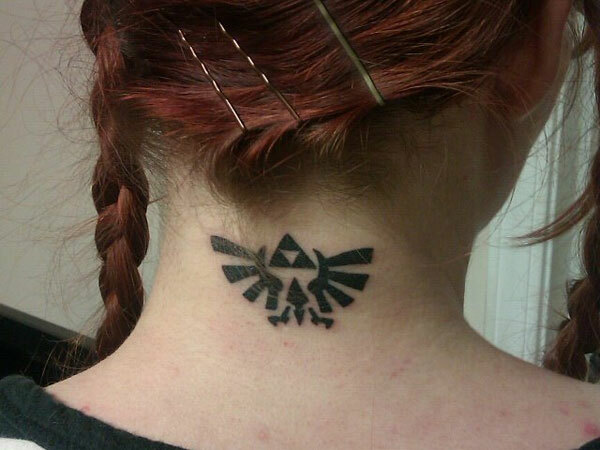 Neck tattoos are style statements. The base of your head is the best place to show off your tattoo. You may feel that getting a tattoo in that area is a painful job. Banish your fears, as this is an appropriate place to have a tiny neat tattoo and the result will make the pain worthwhile. 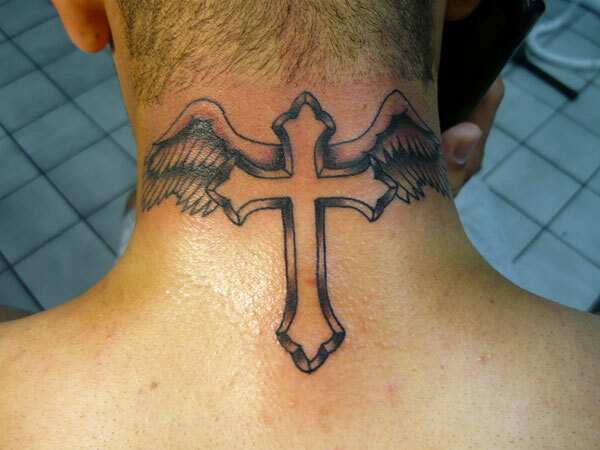 If you are planning to go in for a tattoo on your neck, you can choose from a range of stylish tattoos. Wear stars all the way up your nape, write a word in cursive or try out a flower. 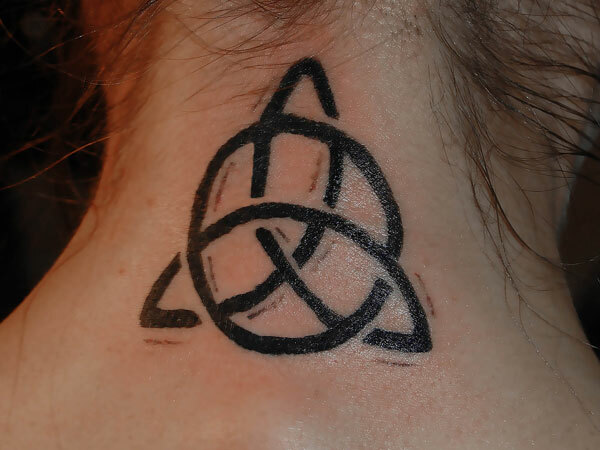 With wasting much thought, go in for one of those back of the neck tattoos. 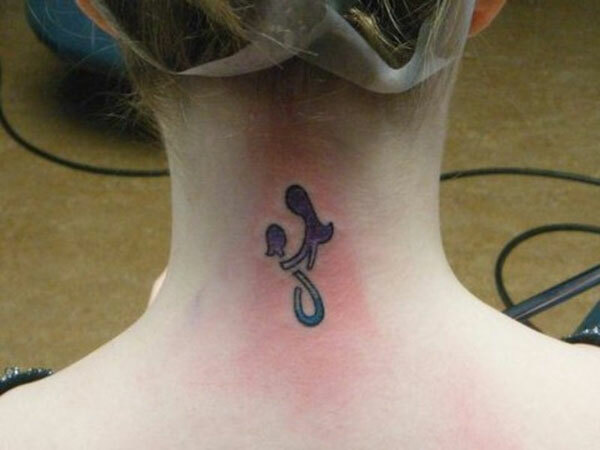 How about getting your first tattoo on your neck? 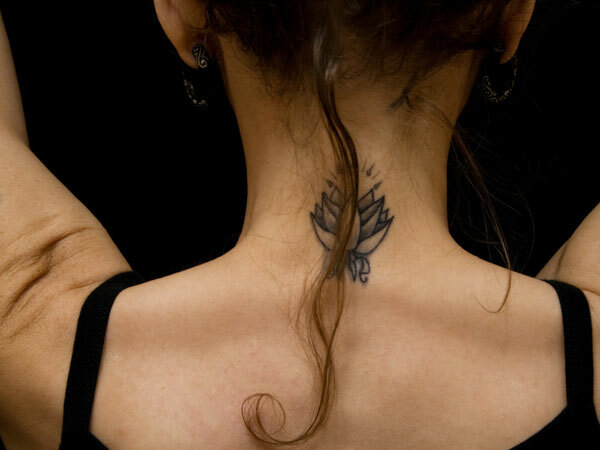 Although a sensitive area, a tattoo at the back of your neck is the best place to show it off. A tattoo that is small in size would look nice here. The idea is to not have a crowded affair on your neck. Go in for a word in cursive, a rosary with a cross, a Hello Kitty, a flower or a heart. 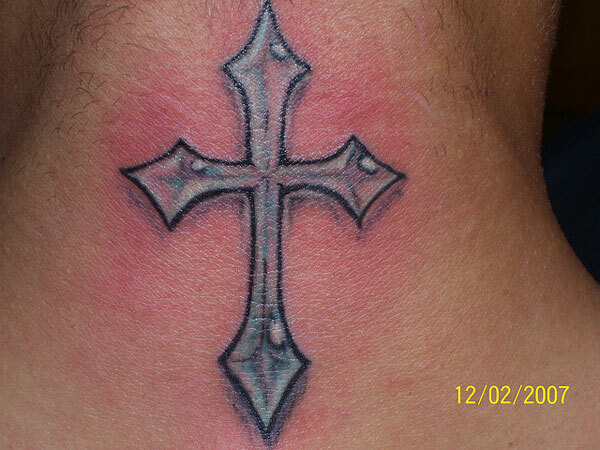 Your tattoo can go all the way up your neck and look stunning and pretty. 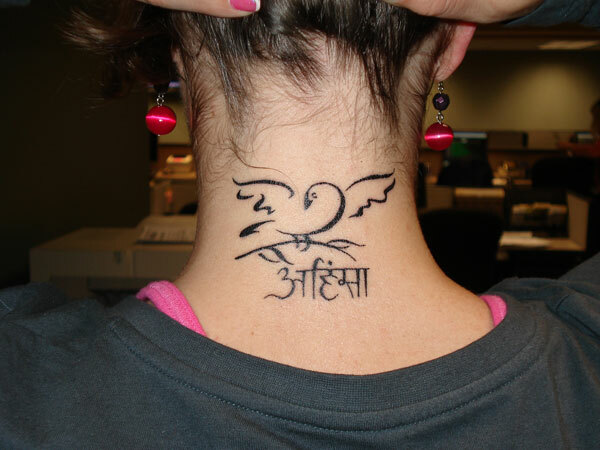 This collection of back of neck tattoos is the destination for that interesting tattoo you would want to sport. If you like this article, you might be interested in some of our other articles on Japanese Tattoos, Thigh Tattoos For Women, Women With Tattoos and Angel Tattoos. 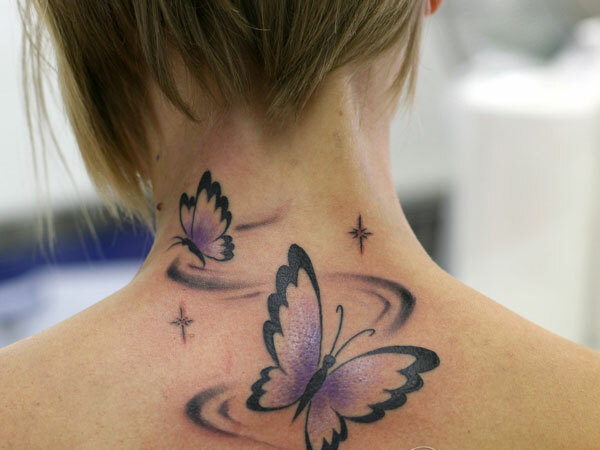 Show two butterflies in flight in a delicate tattoo on the back of your neck. 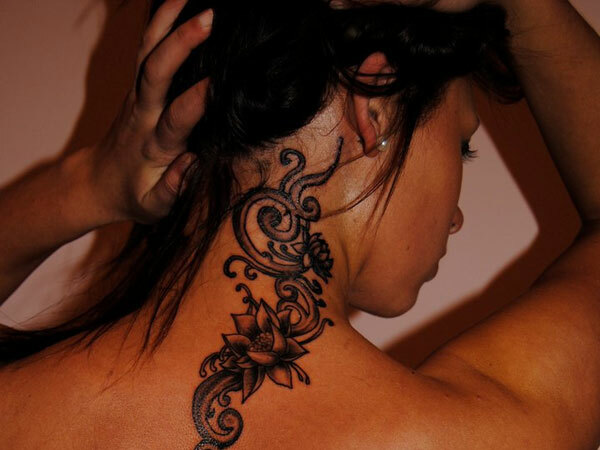 Wear your hair up as you wear pretty flowers all the way up; this tattoo is sure to fetch you a lot of compliments. Get your tattoo artist to sketch a dove with words that mean that we must keep peace amongst all men. 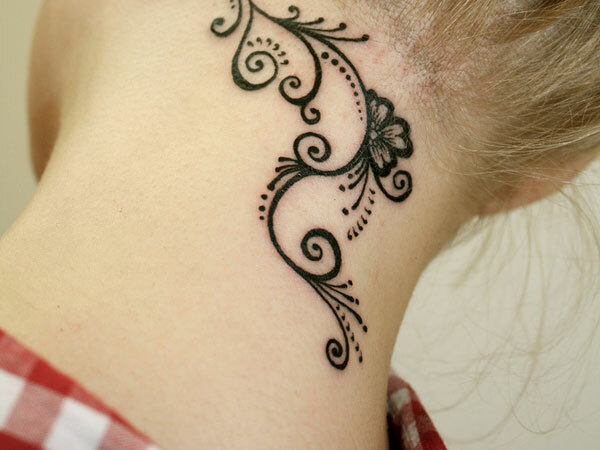 This intricate pattern looks pretty in jet black ink climbing up your nape. 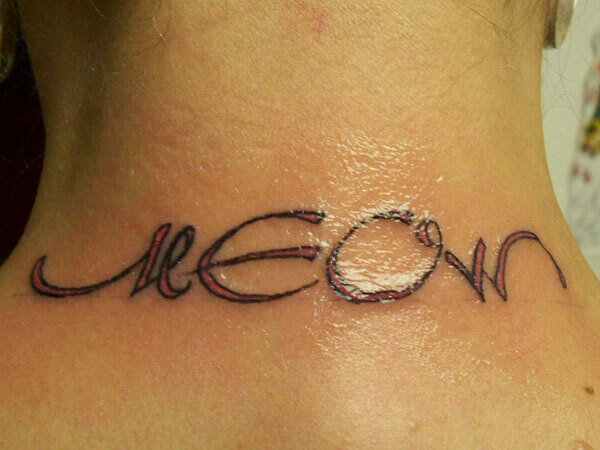 Get a delicate lettering written on your neck to display your love for cats. A symbol of protection on your neck keeps you safe from all adversities. Your cross on the neck constantly reminds you of the man who shed His blood for all mankind. 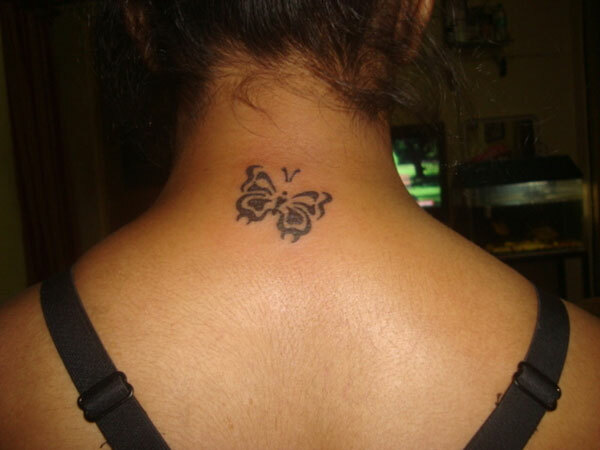 This tattoo of three pink flowers with a butterfly flitting around is a feminine one. 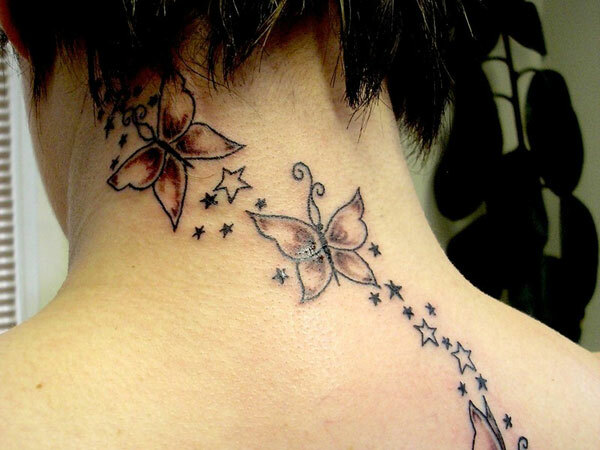 These tiny stars and butterflies in black line art can be mistaken for a piece of jewellery. 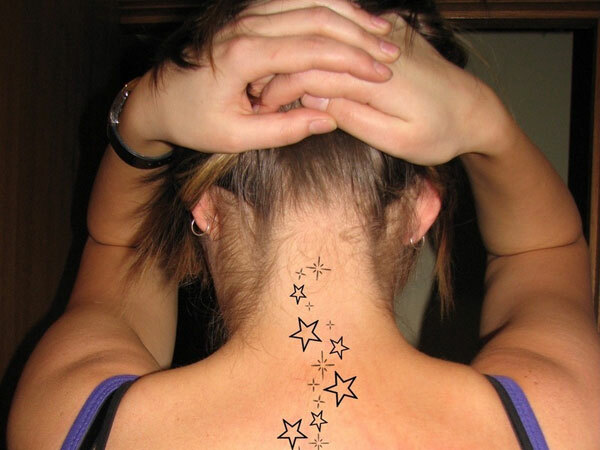 Stars are a popular delicate tattoo to embellish your neck with; perfect if you are a woman. The wings tell you that God loves you and keeps you in His loving care. 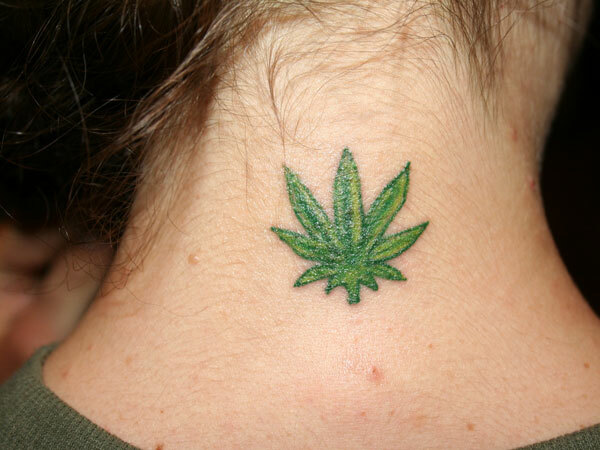 A tiny tattoo of a leaf looks stylish without making too much of a fuss. 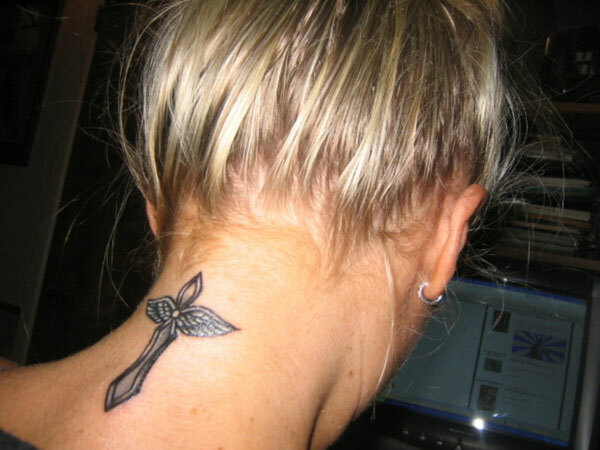 This black tattoo is tiny and perfect to wear at the nape of your neck. A black butterfly rests on the base of your neck and goes well with whichever color you wear. Add a little pattern on your neck to complement your carefree attitude. Ask your tattoo artist to use a curvy hand to make this sketch of a tattoo of a butterfly and a heart. Show you are oozing with confidence as you flaunt this intricate pattern done in black ink on the side of your neck. 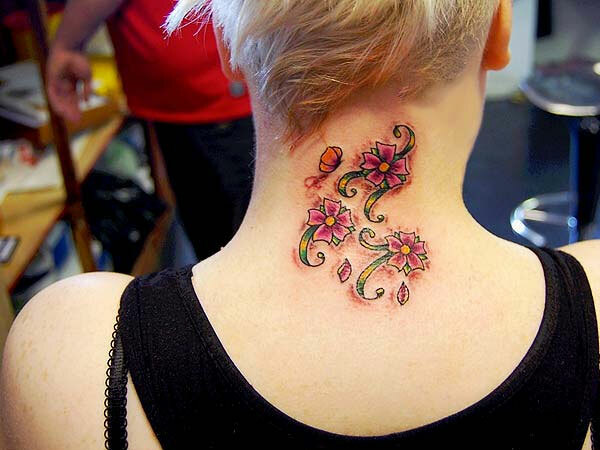 A mix of bright colours can get your tattoo a lot of well deserving attention. 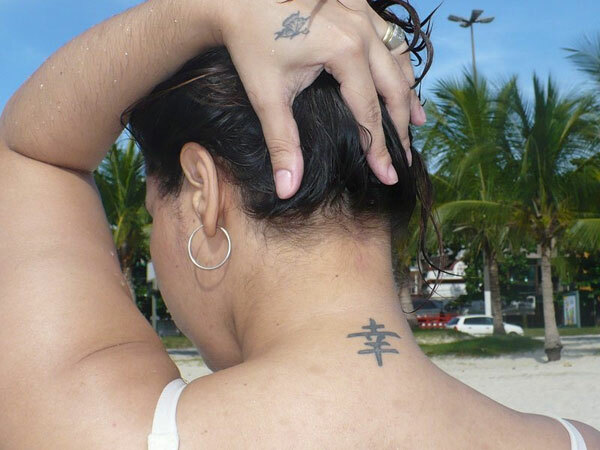 A sand art tattoo on the neck looks delicate; wear a matching dress to highlight it. 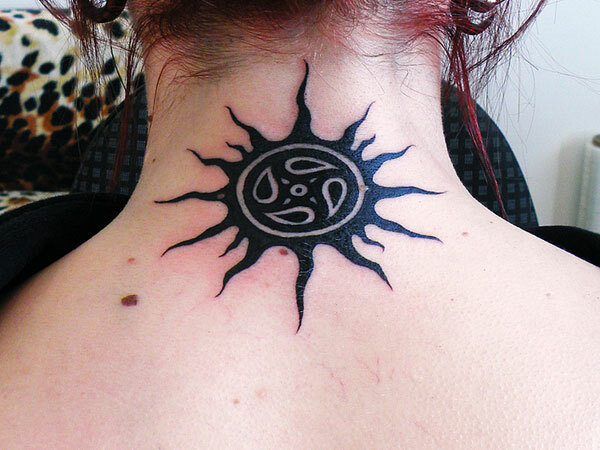 Wear a tattoo done in solid black, in the shape of rays emanating from the centre. Wear a cross with two wings to protect you from all harm and remind you of the great power above. Place this gracious flower just above your shoulders to be in full view. 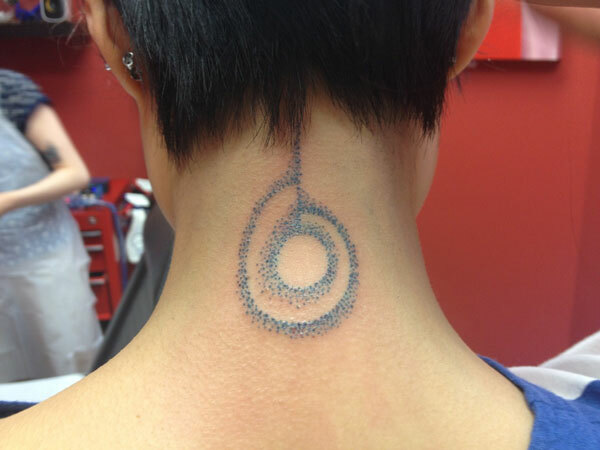 Wear a tattoo in honour of the sun that controls our lives at all times. A triangle is a good idea as it follows the lines of the neck and gets you the compliments you deserve. I liked the MEOW tattoo design on the neck of the lady. Its just beautiful and attractive. Non Violence neck tattoo design is very much cool. And i liked it the most because i am too the supporter of non – violence. Attractive rose is very pretty for the neck. 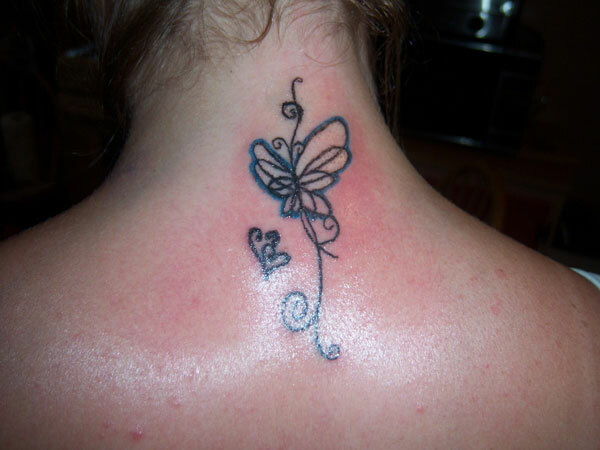 The Springtime tattoo design is indeed very elegant looking tattoo design. The butterflies are so cute! 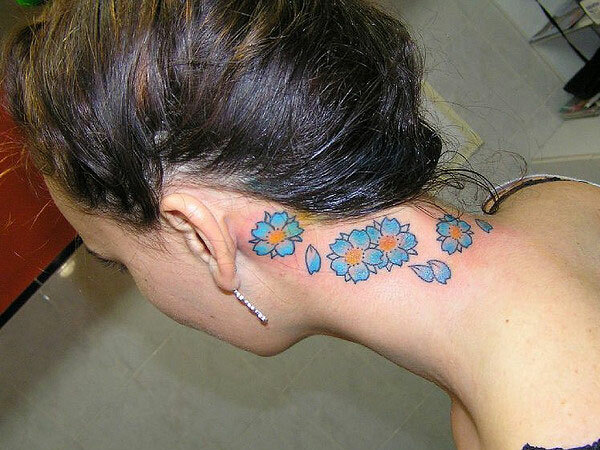 These Elegant Back of Neck Tattoos are very pretty and good looking one. The Delicate neck tattoo is looking very great and cool one among all the neck tattoo. 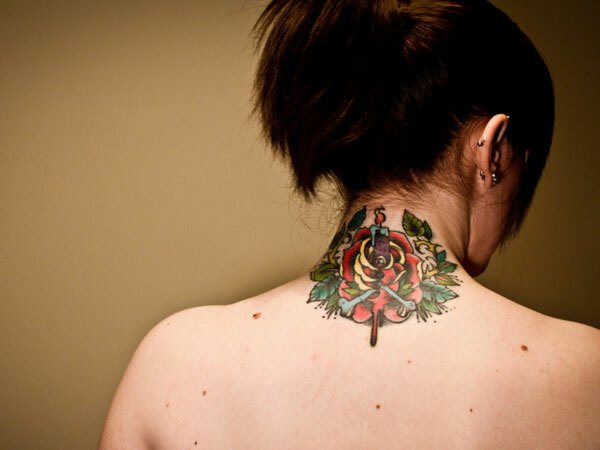 The Attractive Rose neck tattoo is really attractive one .